Aimed at small but busy workgroups, the Canon IRC-5051 lets them improve their workflow with an easy-to-use multifunction printer. The Canon ImageRUNNER ADVANCE C5051 office colour printer is praised for its speed and low running costs, as well as for its myriad of business-friendly tools and multi-tasking options, but the high initial cost of the IRC-5051 copier could make the budget-conscious look for other options. This tall freestanding device is designed for comfortable usage with a large adjustable 8.4-inch colour display screen on the right-hand side. The topmost section of the Canon IRC5051 colour laser printer is dominated by the flatbed scanner with the automatic document feeder, while all paper cassettes are conveniently loaded in the front bottom section of the device. The ImageRUNNER C5051 colour copier is heavy but compact. The Canon IR C5051 photocopier prints reasonably fast, at up to 51ppm in either black-and-white or colour. The user interface is intuitive for ease of use. 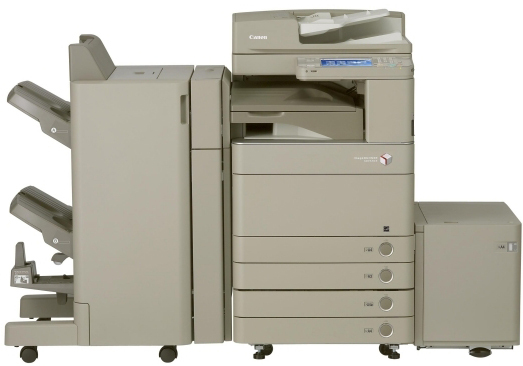 The Canon IRC-5051 multifunction copier prints good quality documents for business correspondence. The secure device offers internal finishing options, two menus, a large display screen, and Ethernet connectivity. The feeder of the Canon IRC-5051 laser printer is a single-pass duplexing ADF, which helps save time and resources. Ideal for productive work places, the Canon IR-C5051 colour cartridges hold up to 38,000 pages worth of toner which means speedy colour output can be printed very economically. The Canon IRC-5051 printer is expensive and though it is designed for small offices, its functions and capabilities are much better for larger workgroups. The scanner and copier may not be able to retain the details of complicated graphics and documents because of the limited 600dpi resolution. The Canon IR-C5051 colour MFP is not reliable enough for printing lab-quality photos. Wi-Fi is only an option for this unit, as well as the barcode printing kit and the super G3 fax board.